In the 12th Century, the English throne is being contested by two claimants. Queen Maud, the eldest child and daughter of the late king and named as his successor, and King Stephen, the king's nephew who has the backing of the Church and much of the nobility. As the civil war known as the Anarchy rages, other noble families take advantage of the chaos to their own ends, as the Hamleighs seize control of Shiring Castle after denouncing its lord to Stephen as a traitor. The lord's heirs, Aliena and Richard, vow to regain their birthright. 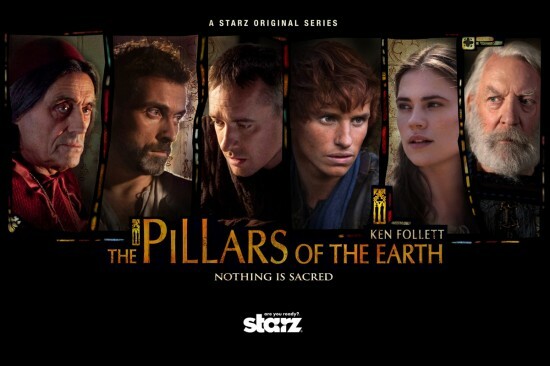 Pillars of the Earth is an eight-part TV miniseries, based on Ken Follett's novel of the same name. At its heart it chronicles the building of a cathedral in the (fictitious) village of Kingsbridge against both religious and secular opposition, around which swirls a number of real and fictional historical events relating to a bloody civil war and dynastic struggles for power. It has a notable cast featuring established actors such as Donald Sutherland, Rufus Sewell, Ian McShane, Matthew Macfadyn, Robert Bathurst and Sarah Parish, and relative newcomers like Hayley Atwell and Eddie Redmayne (who, if he was a few years younger, would have made a great Rand al'Thor if the Wheel of Time movie had ever gotten off the ground). It also has a reasonable budget (coming in at $5 million per episode) and excellent production values, with some great CGI and some nice Eastern European location shooting (albeit the fact that none of the locations look remotely like their actual English counterparts, but what the heck). Is the series a success? Yes and no. If you've read the book you'll know what you are in for: lots of cheesy melodrama, a lack of historical accuracy, a dearth of character depth and some truly inane dialogue. At the same time, there's something fundamentally likable about this derivative story and its corny characters. The actors give enthusiastic performances (though Ian McShane is clearly lamenting the lack of the more nuanced scripts he had to work with on Deadwood and in some scenes is on autopilot) and, most importantly, the scriptwriter has squeezed the thousand-page story into eight episodes, which keeps it rocketing along like a greyhound on crack. Spinning it out to ten or twelve episodes would have resulted in longueurs packed with filler which the book suffers from in some sections. As it stands, the television adaptation doesn't really stand still long enough for the viewer to fully process its flaws (although there'll still be audible groans when William Hamleigh turns up to burn down Kingsbridge for what feels like the fortieth time). Those flaws are legion but don't really seem to detract from the watchability of the series (although this may also be attributable to how terrible almost everything else is on TV these days). This is tosh of the highest order, then, but highly watchable tosh which does not require much exercising of the old grey matter. The Pillars of the Earth (***) is available now on DVD in the UK and USA. 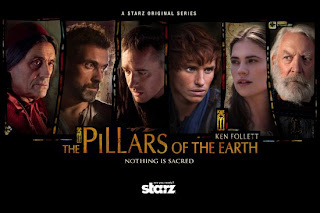 In Germany "The Pillars of the Earth" is a four-episode series which airs these days. They gave it a prime-time slot on monday which was quite successful up to now. I watched 25-30 minutes of the first episode and gave up, it reiterated to me just how hard it seems to be to make fantasy/medieval type stories into watchable TV and Film. It really doesn't give me hope for Game Of Thrones, these shows are always just so frickin' cheesy! Maybe GRRMs dialogue and the production team can pull it off. God I certainly hope so. THE TUDORS, or what I saw of it, looked stronger, though still not as strong as a HBO series. @ Marcus: Yes, the novel is absolutely huge in Germany, I believe, and Follett was heavily encouraged by his German publisher who'd wanted to publish a novel about building a cathedral for a long time. Apparently the original German edition of THE PILLARS OF THE EARTH is something of a work of art in its own right. I've been watching this on Netflix and really enjoying it. It's cheesy, and unrealistic, but I can't look away! It's very watchable, not too deep, kinda soap opera-y. and Eddie Redmayne who plays Jack? I just dig him.